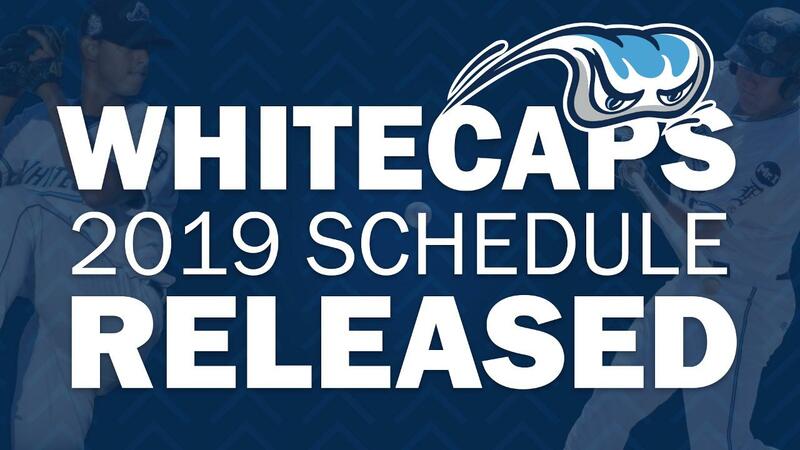 Comstock Park, MI - The West Michigan Whitecaps have announced their schedule for the 2019 season. The team hopes to build on its semifinal playoff appearance in 2018 when it starts its 26th season on the road at South Bend on Thursday, April 4. The Whitecaps' home opener is on Saturday, April 6 against the South Bend Cubs at 4 p.m., followed by a 2 p.m. contest on Sunday, April 7. The home season includes 70 home games of a 140-game schedule that will run through September 2. "The Tigers have always given us great talent and we're eager to see the next crop of future Major League players come throught West Michigan," said Whitecaps Promotions Manager Matt Hoffman. "Off of the field, we're excited to build off a successful 2018 season that brought new and exciting promotions to Fifth Third Ballpark. We're always looking to keep the experience fresh and several new promotions are being planned. The fans can expect to see some big things in 2019!" The month of April includes 12 home dates, with three Saturdays (4 p.m. start time), three Sundays (2 p.m. start time) and six weekday games (five at 6:35 p.m. and a special noon matinee on Wednesday, April 17). May is the heaviest month of the season with 17 home games including a six-game homestand May 6-11 against the Peoria Chiefs and Cedar Rapids Kernels. The longest homestand of the season, an 8-game set, runs May 16-23 against the Great Lakes Loons and the Bowling Green Hot Rods. Twelve home games are scheduled in June, including the 14th annual Star Wars on Saturday, June 29. In July, the Whitecaps are home for the 4th of July holiday and 14 other games, including an encore of the Salute to Beer City USA, when the Beer City Bung Hammers will try to keep their one-game winning streak alive on Saturday, July 27. August features 14 home games, including a mid-month seven-game homestand August 14-20, and the regular season home finale is scheduled for Tuesday, August 27. The season concludes on the road at Dayton on Monday, September 2. Blue Cross Blue Shield School Days, popular as school enrichment field trips, are returning with four 11 a.m. games on Wednesday, May 8, Wednesday, May 22, Thursday, May 23, and Wednesday, May 29. Fireworks will electrify the night sky over Fifth Third Ballpark with 20 Family Fare Fireworks Nights, including Saturdays in May and every Wednesday and Saturday starting in June, plus selected additional nights including a special Independence Day celebration on Thursday, July 4 and Friday, July 5. Tigers Wednesdays will return, with all five Wednesday home dates in the second half of the season beginning with June 26 to feature appearances by former Tiger players as well as Tiger-related giveaway items for the first 1,000 fans. Player appearances will be announced at a later date. FANomenal Fridays return for a second season, starting May 10. These family - and kid -focused nights will include themes such as Paw Patrol, Princess Night, Superhero Night and Harry Potter Night among others, with entertainers and special events on the concourse. To beat the heat, there will be three later Sunday start times in the Summer. June 30, July 14 and July 28 will all be 6 pm game times. The rest of the Sunday games will be at 2 pm. New this season is a series of five College Rivalry Nights, which will take place at games throughout the season. Building on the success of the Michigan State/Michigan Rivalry Night, the Whitecaps have added four more rivalry nights, including Central Michigan/Western Michigan, Calvin/Hope, Aquinas/Davenport and Grand Valley State/Ferris State. Dates for these rivalry nights are to be determined. Thursday: Altogas Thrifty Thursdays ($2 hot dogs, Pepsi products and 20 oz beers); show a college or military ID and get $5 reserved seats. Many more promotions will be added throughout the off-season, and will be uploaded to the Whitecaps website as they are booked. Fans can purchase season tickets and mini plans beginning Tuesday, October 30 by calling the Whitecaps front office at (616) 784-4131. Tickets for groups of 20 or more, including private party areas, will go on sale Friday, November 16. Individual game tickets will go on sale in early 2019.